3 km. east of Toulon, take route D29. Coiled around a rocky peak between Mount Coudon and the Mediterranean, the old village has kept its original medieval character. 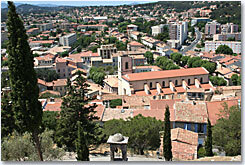 Although La Garde is in the outskirts of Toulon, it is a city of its own, with its own history, and its own preoccupations. 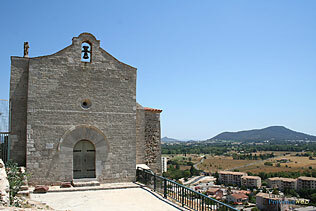 The Romanesque chapel and the old village are of particular interest. La Garde's coastline is complete with nice beaches and charming inlets. If the group of folklore music Les Farigoulettes (named after Provençal plants), happens to be performing at the time of your visit, you shouldn't miss them. 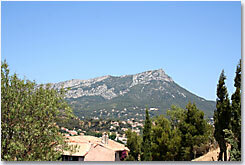 The city has also dedicated a museum to one of its native sons, the writer Jean Aicard. .
La Garde entrusts its economic future to its university, to the commercial center Grand Var and the immense industrial zone that it shares with Toulon. The rocky peak. Old Garde and the castle. Le Pradet (3 km), La Farlede (7 km) and La Crau (7 km).